We work with people who are living homeless and with their animal companions. Offering compassion to both ends of the leash we promote the well-being of both. Why such a niche service ? The vast majority of homeless services and agencies with which people living homeless come into contact do not make provision for companion animals. The majority of those living homeless are adamant that they will not 'trade' their animal companion for services or accommodation. This leaves many people sleeping rough, unable to gain support from some health and human service providers, sometimes not able to shower, get clean clothes or food. So what exactly do we do ? In addition to developing hands on practical services we research, talk about and promote projects working with people living homeless with animal companions. Living homeless with animal companions has received limited attention in terms of homelessness and human-animal interaction research and in terms of practical service delivery. 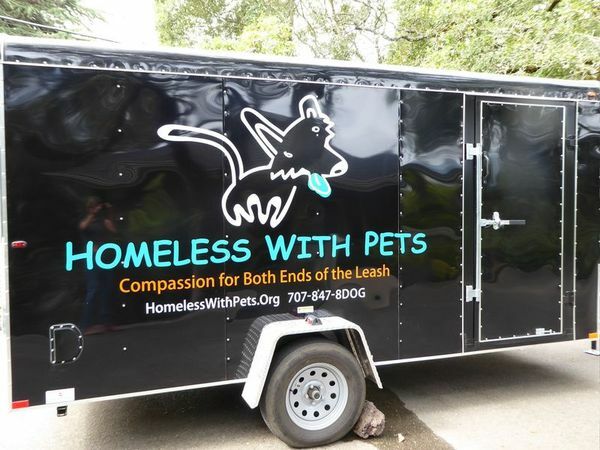 Homeless With Pets seeks to fill these gaps and provide some support and direction to others wanting to develop services to include those living homeless with animal companions. Living homeless with animal companions can generate a surprising amount of passing judgment. 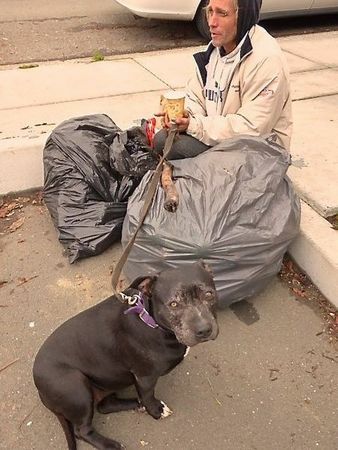 Public opinion it seems polarizes into thinking “how cute” and being very touched by the presence of the animal with a homeless person (most often a dog) or moving to judgment that as homeless people "can’t look after themselves why should they have an animal?”. Some express disbelief that the animal is a companion and suggest it is more of a ploy to elicit greater sympathy and money when panhandling. Yet the reality is more nuanced than this and many will forgo services and appointments so as not to forgo the company of their companion animal. Is this a wise decision for the person’s or the animal’s well-being, probably not, but it is based in the belief that animal and person co-exist for one another. Many who feel that they have been badly let down by social institutions hold a strong conviction that they must not do the same to their animal companion. There is a page on this website about the human-animal bond and this is just this is the starting point. Human and animal share mutual affection; they are travelers in difficult situations. The animal allows the person to express love, caring, to be a provider and to be a responsible person when there are so few opportunities for them to do this. How many homeless people have animal companions ? In 2009 the National Coalition for the Homeless suggested up to 24% of people living homeless in certain parts of the US may have an animal companion. Experientially this seems a reasonable estimate to Homeless With Pets. California has 21% of the US homeless population. It is the premier US state for homelessness with 113,952 people. California has 25% of the single homeless population of the US or 90,765 people and 38% of all chronically homeless. These figures all relate to the homeless count which took place one day in January 2014. Santa Rosa, Petaluma and the rest of Sonoma County features at or near the very top of the homelessness league tables for smaller cities and counties. Sonoma leads many other towns and counties for single homelessness, homelessness amongst youth and unaccompanied children, and veterans. The homeless population on the day of the count being with a total of 3,816 people. Assuming 24% of homeless people have an animal companion then 27,348 homeless people would be with an animal in California on count day and 916 in Sonoma County. If this is the number on any one night and we know that very few people with animals are housed then one could estimate that in Sonoma County alone homeless people are out with their animals for 334,282 nights in a year. So this is a problem. People need resources to care for their animals. Homeless With Pets helps people with resources, to learn about compassionate and humane animal care, and to re-engage with services. Homeless With Pets helps services to develop ways to integrate animals into their provision. Please click the subscribe button below and use the menu to select the level at which you would like to support us for 2019. 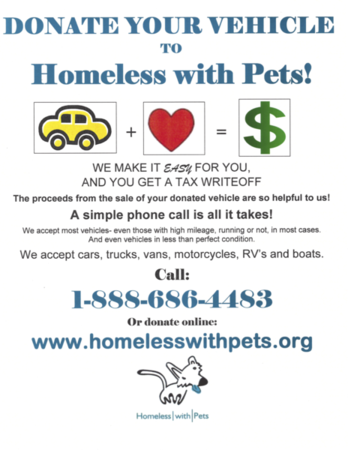 Your donation will be used to ensure that Homeless With Pets can deliver its mission, working with people living homeless with their animal companions. 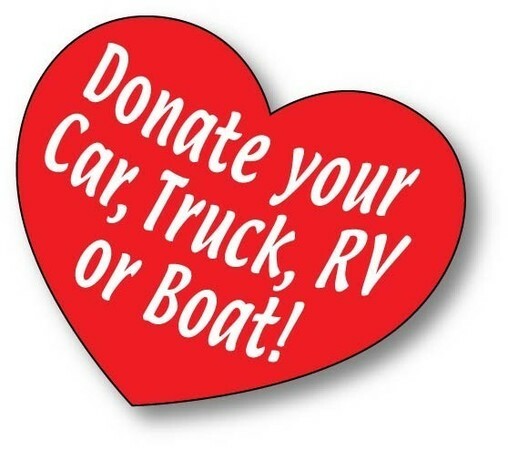 You will be issued with a letter for the IRS outlining your donation to the Giving Circle. Please help us serve and support people and their animal companions in our community during 2019. Please download this pdf, print some and post these fliers on your community, church and workplace noticeboards.